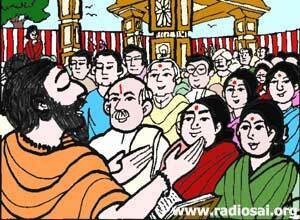 To access all the previous 'Chinna Katha' stories, please click here. One man got into the habit of eating opium. It was not possible for him to control this habit. He was always in a kind of coma. 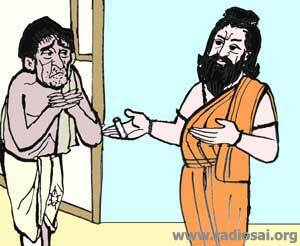 A saintly person visited his city and was offering advice and comfort to many. The opium-eater also sought the advice of the saint. The saint said that his health was deteriorating and that he should give up eating opium. At this, the opium addict said that it was not possible for him to give it up. He requested the saint to give him some advice. The saint asked him how much of opium he used to take every day and was shown a certain lump as the quantity being taken every day. The saint got a piece of chalk, equal to the lump of opium and told him that he may continue eating opium but should not take more than the weight of the chalk each day. The opium eater was quite happy but he was also told that every day he must write “OM” three times on a blackboard with that chalk. In this manner, the chalk was reduced in size every day and so the amount of opium which the person was eating also got reduced gradually and ultimately this habit was removed. To access all the previous stories, please click here.